Hello everyone. 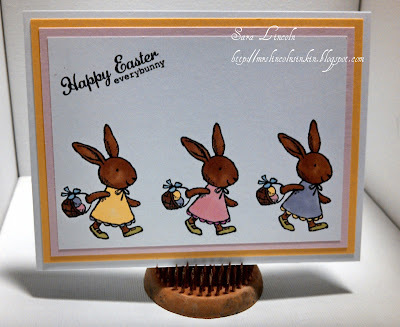 A quick and super simple Easter card today. 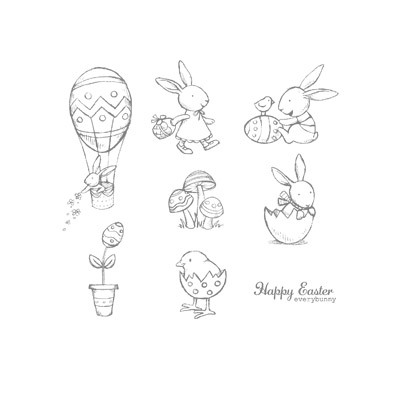 In This Easter card i wanted to show that all cards don't have to be "busy" to be beautiful! This card i used the stamp set Everybunny, such a great set! I wanted it to look as though the bunnies were just walking along their merry way, lol. I used 3 layers for my card. The first was a piece of Daffodil Delight cut at 5" 3 3/4". The next piece is Pink Pirouette cut at 3 1/2" x 4 3/4". The next is my Whisper White, where i also put my image. This piece is cut at 4 1/2" x 3 1/4". I used my Copic markers to color n my Bunnies (those colors are listed below in my Supply List.